My classroom has recently received one Chromebook for every student in my class. The excitement of the news that we were getting Chromebooks was quickly followed with the dread of figuring out how to balance the responsibility of 25 Chromebooks in my classroom. So, I decided to focus in on expectations, expectations, expectations! 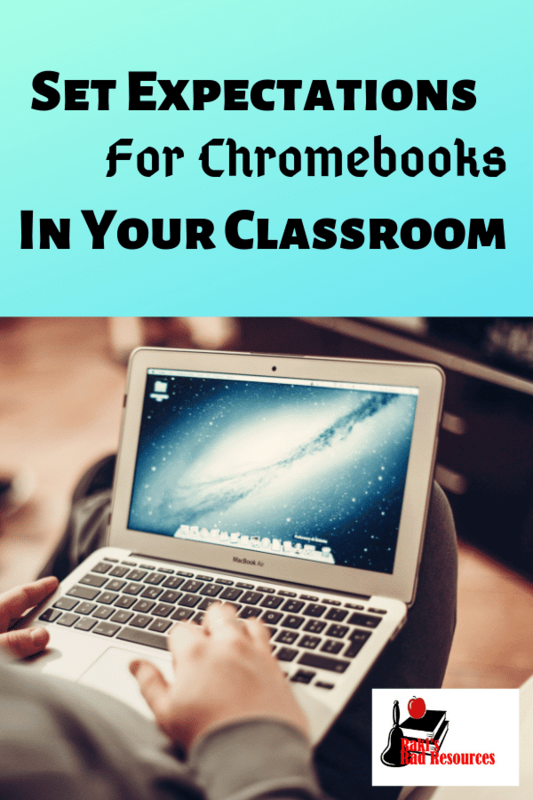 How Do I Teach Chromebook Expectations? 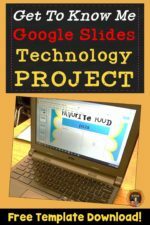 In order to teach my students what I expect from them when they are using their Chromebooks, I created a poster that is posted on our Chromebook cart. As a class, we reviewed the poster and went over the different ways that these expectations could look in our classroom. 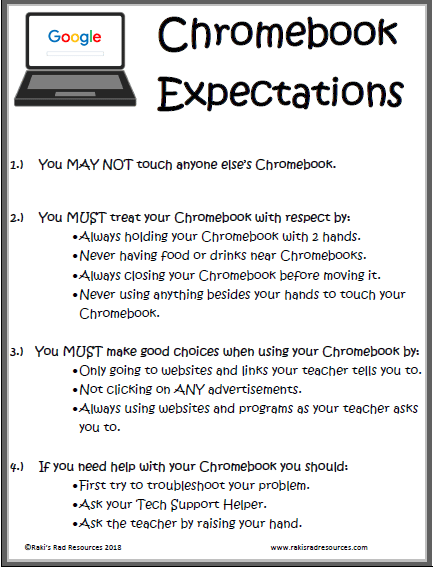 Now, every time I have to talk to the students about anything about their Chromebooks, we go back to our poster and discuss our expectations. If you want to use my poster, feel free to click over to my blog and download a copy. What Expectations Should We Have for Technology? Different classrooms will have different expectations. However, all classrooms should teach students to respect the technology they have and to use it responsibly. This means we need to have specifications on how we hold and touch the technology as well as expectations on what we will use the technology for. These expectations should be different for a 3rd grader compared to a high school student. However, the expectations on my poster should be generic enough for most classrooms. Students should hold the classroom carefully and only go where they are asked to go. This could be as specific as: ‘use these links; for 3rd grade. Or this could be expressed as: ‘complete research on this topic’ for high schoolers. Either way, setting expectations for technology use is more and more important each passing year. So please stop by my blog – Raki’s Rad Resources – and download a copy of this poster to use in your classroom.